Join the discussion on our forums! Come discuss Nesting Roc over in our dedicated Nesting Roc discussion topic. I don't know how much everyone else uses this card, but it has been amazing for me. 4/7 stat line is really difficult to remove, especially in priest matchup. It's like a sludge Belcher with both minions packed together as one. As vanilla card, it's great and it's really easy to get the taunt. Beast synergy on top of that really kills it. 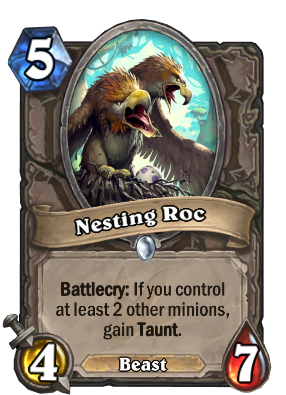 This is crucial card in my menagerie quest shaman deck featuring mainly taunt beasts and murlocs. pretty good arena card, 4/7 is a good body for 5 mana. pala can use the hero power for 1 missing (low mana cost) minion to trigger taunt. Taunts are good against minion spam and this card answers to that nicely. Especially against very spammy decks that ignore your minions. Maybe a top end in zoo? Probably not. 4/7 is a decent statline for a 5-drop, and with taunt it's a lot better than Fen Creeper, especially since it's out of range of Shadow Word: Pain and Fireball. I'd say this one is roc solid. But on "with taunt it's a lot better than Fen Creeper" I agree up to a point. OK for the better statline and being out of range of those spells, but you get taunt only if you have at least other 2 minions on board... which happens often enough but is not always the case. I'd say the level of alotbetterness (if that was a word, lol) is a bit situational. Depending not only on board state but also on deck type (beast-based or not). It's not even a beast, either. I cry every time. Just goes to show the living are superior to the machine (or golem). Very powerful card in Arena. Technically has 5/6 worth of stats which is already good for a 5 mana. It also has the beast tag on it and can gain taunt just by having two minions. What is this Journey to Taunt'goro? The Black Knight may rise once again.